Santa’s Village in Jefferson, New Hampshire is a holiday-themed amusement park. The park is home to a variety of thrill rides, water park rides, and shows. Rides cater to families with children under the age of 13. Two roller coasters in the park include Poogie’s Penguin’s Spin Out Coaster, the park’s newest and largest ride, and the smaller Rudy’s Rapid Transit Coaster. The Chimney Drop is a free fall thrill ride which mimics Santa’s drop down a chimney. The Skyway Sleigh is a monorail, 30-feet above ground, which mimics what it would feel like to fly in Santa’s Sleigh. A 16-seat Christmas-themed Ferris Wheel offers views of Mount Washington and the Presidential Range at the top. Rockin’ Around the Christmas Tree is a classic swing ride on a tilting center. Rides for smaller children include Santa’s Express Train, which tours visitors around the park on the Jingle Bell Express, and the Reindeer Carousel, a traditional carousel ride. 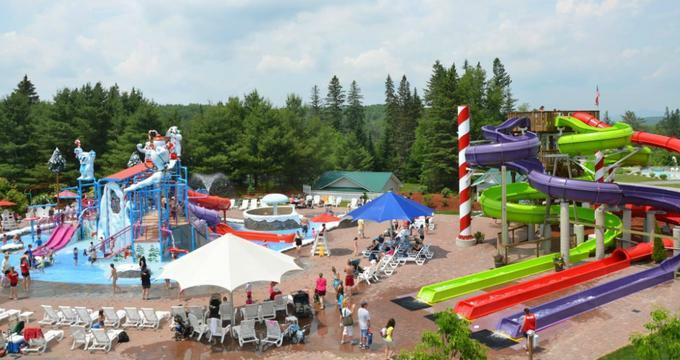 The Ho Ho H2O Water Park offers a splash pad, water slides and climbing equipment. A giant bucket of water dumps onto guests every few minutes from the top of the climbing apparatus. Joy Ride Slides are adjacent to the splash pad and offer three different three-story water slides. Family changing rooms and locker rooms are available, and swim gear is sold for those who didn’t plan ahead to get wet. Santa Claus himself is present at the park daily and can be found at Santa’s Home. Visitors can met Santa’s reindeer in their barn at the Reindeer Rendezvous. Treats may be purchased to hand feed to the reindeer, who also love to be pet. Santa’s Blacksmith Shop not only makes shoes for the reindeer, but makes ‘good luck’ rings for children, a traditional collector’s item from Santa’s Village. History: The idea for Santa’s Village was originally conceived by Norman Dubois and his wife, Cecile. When they noticed deer crossing the road in their New Hampshire home town, they realized the area was prime for a park based on Santa and his reindeer. The park opened on Father’s Day in 1953 complete with live reindeer, Santa Claus and his elves. Additions were made in 1955, including Santa’s Schoolhouse as well as Santa’s Workshop. By 1969, the park had added several restaurants, playgrounds, and the Jingle Jamboree. The family business passed to Norman and Cecile’s son-in-law Michael Gaynor in 1974. Gaynor further expanded the park and added the Yule Log Flume ride as a mode of transportation. The park is managed today by the Dubois’ grandchildren who took on the duties in 1986. Features added under their watch include the 3-D Polar Theater, the newest of the park’s three performance venues. Ongoing Programs and Education: The Polar Theater is home to several 3D shows. A Tinkerdoodle Christmas introduces guests to Tink, Santa’s main elf, via a 3-D animated feature. The Jinglebell Theater hosts Tinker’s Tune Up. Story Time with Celeste is geared towards younger children. The Merry Main Street Block Party takes place daily each summer afternoon, while Santa’s Light Show takes place after dark, illuminating the park to a holiday soundtrack. Summer Season runs from Father’s Day weekend in June through Labor Day weekend in September. The water park is open during this time. The autumn season continues through October and includes the Silly, Spooky Halloween Extravaganza. The Halloween event is now in its ninth season. Children are encouraged to arrive in costume, and the park is split into ‘spooky’ and ‘fun’ zones for age-appropriate entertainment. Christmas season begins just after Halloween. 18 of the park’s 23 rides are available during the Christmas season, and the Polar Theater shows A Tinkerdoodle Christmas. Santa and Mrs. Claus greet all guests, and the park remains open after dark for visitors to enjoy the Christmas lights displays. A New Year’s Eve Partybration is now in its tenth year. Rides are open into the evening and a fireworks show begins at 8pm. Guests are encouraged to purchase tickets in advance as attendance is capped and the annual event is frequently sold out. What’s Nearby: While Santa’s Village does not offer on-site lodging, several options are available nearby and in neighboring towns. The Lantern Resort in Jefferson is the official resort of Santa’s Village. The family friendly motel and campgrounds offer daily activities for kids, including S’Mores making, hay wagon rides, and glow-in-the-dark pool parties during the summer months.